After sleeping in again, we decided we would hop on the monorail and head down to Ballys and the Paris. 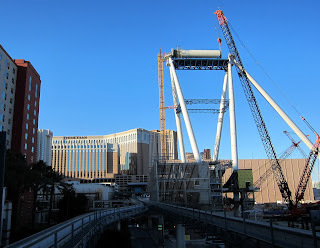 We were able to get a closer look at the construction of the Linq Project from the monorail and it is really a massive project. 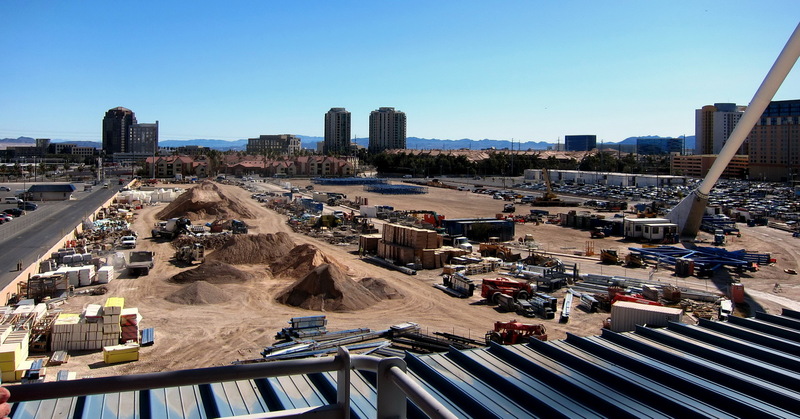 The back half of the site of the Linq Project. A closer and better view of the towers for the High Roller observation wheel. The monorail arrives and it's time to head for the Paris. We walked around a bit and had lunch at the café at the Paris. The Paris café is much nicer than the one at Harrah’s and we had a very good lunch. 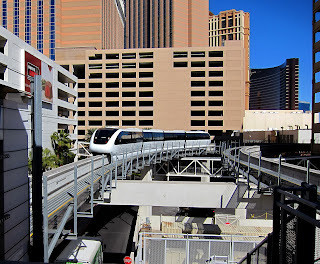 From there we decided to get back on the monorail and head down to the MGM Grand. The MGM Grand is a huge place so we did a lot of walking. Val did excellent gambling while I had a terrible day. In fact I finally just quit and watched her win to preserve what money I had left. Finally around four, she decided to head to Harrah’s so it was back to the monorail for the trip back. At Harrah’s it was back to the room to cleanup and relax a bit before we headed out for the evening. As usual, we spent most of the evening gambling, again with mixed results. Unfortunately for me, this meant Val had a very good night and I did terrible. Only a fortuitous win at the end of the night saved me from a complete disaster. Oh well, there's always tomorrow. We kind of let time get away from us so dinner tonight was a late meal at KGB Burger, the gourmet burger restaurant at Harrahs's which is pretty good. After that we returned to the room for the night. Tomorrow is our last day in Las Vegas before we head to Death Valley.